Starting at a new school for senior year is no easy thing, but at least Tara Luna has a lot of experience with new schools. Her Uncle Pat, Tara's guardian since her parents' death years ago, is a throwback to hippie days, a free spirit with wanderlust in his soul. New schools were old hat to Tara. Still, she wasn't exactly looking forward to what she knew was coming. Fortunately Tara, who wouldn't mind being a normal girl but had long since given up that particular pipe dream, at least knew she had the...undying...support of her two best friends. Sure, they were the ghosts of a long-dead young man and woman who had watched out for Tara as long as she could remember, but what with that whole beggars/choosers thing, she couldn't really complain. And maybe their new home and her new school wouldn't be so bad. Stumbling into a dark and draining spirit in the kitchen of their new rental home and drawing the taunting scorn of a trio of popular cheerleaders on the first day of classes seems to provide all evidence to the contrary, however. On the bright side, there's a cute guy in a couple of her classes and he's been nice to her right from the start. If he knew she's a psychic who can see and speak to ghosts he'd think she's insane, but still. Her life is crazy, that's for sure, but Tara is used to it, such as it is. But the dark spirit haunting their new home turns out to be the murdered ghost of a former resident and one of the cheerless cheerleaders goes missing one afternoon after school. 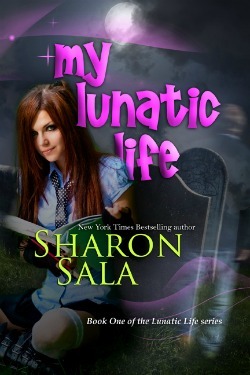 Suddenly crazy would be an improvement on Tara's lunatic life, and her abilities, not to mention her protective poltergeists, may be the only things that can help Tara solve one murder and prevent another. Young Adult fiction isn't my forte. I don't read much of it, and when I do, it's more the sort of stuff that is intended to appeal to adults as well. This one isn't quite complex enough to do that, yet I couldn't help but be entertained by the spunky, forthright Tara and the charming secondary characters, in particular bad-boy-with-a-heart-of-gold Flynn and ghosts Millicent and Henry. This isn't a YA novel oozing teen angst and relationship drama, a fact that I heartily appreciate. There are many very popular vehicles for that fiction, but I'm not a fan and I try to avoid it. This book is more akin to a paranormal Nancy Drew mystery, really, and that was part of what I liked about it. I certainly don't have the experience to compare it to much of anything else out there, but I found myself smiling throughout the book and really enjoying Tara's personality as she dealt with a new school, making new friends, and trying to do the right thing for the dead and not-yet-dead. I don't know that it was all that realistic or true-to-life on a character level, and there were a few parts...and characters...that even I recognized as being a bit too good to be true, but there were also a few - very brief - moments in which the all-too-real darker side of life was on display. It was mostly a simple, sweet, fun tale about a psychic girl who struggles with life and tries to do the right thing. There was a bit of mystery, a bit of spookiness, and a bit of grim horror. It isn't terribly complex, it isn't some sweeping epic, but it is entertaining, and it is definitely enough to have me wondering how Tara is going to solve the crime of DeeDee's murder and what her lunatic life is going to look like now. I'm surprised...pleasantly surprised...to say that I'm interested in finding out.